How concerned about the issue you’re writing about? How familiar with your material? How interested in your material? How much attention available to devote to you? How set in his or her ways? This is just a sampling of questions; there may be many more. You don’t have to answer all of them, but by attempting to answer some, you will have a better chance of focusing your writing, and that will be helpful to you and to your audience. Clarity. Everything in your piece should be as clear as can be. That doesn’t mean you have to completely forgo ambiguity, which can be a powerful tool in certain kinds of writing, but it does mean that, sentence to sentence and paragraph to paragraph, you should strive to be as clear as possible. Ambiguity only works if you understand the point of your own writing. Ambiguity is not synonymous with confusion. Conciseness. Generally speaking, readers are stingy with their time. Everyone has a lot to do these days, and when a reader is given something to read, the implicit understanding — that is, the implicit contract — stipulates that the Writer (you) will not waste the Reader’s time. In other words, fewer words. Fewer adjectives, fewer adverbs, fewer metaphors, and more clean, muscular prose. And keep in mind that faulty punctuation also takes up the reader’s time — what is that comma doing there? — which is why everything must be pored over carefully. Construction. It is no real stretch to compare a piece of writing to a piece of cabinetry. Both demand a high level of functionality, an appreciation for aesthetics, a good finish, and clean lines. Those clean lines are part of your contract with the reader. We can’t expect a reader to jump all over the place, trying to keep pace with the random shifts of the writer’s thought processes. When you are telling a story — which oftentimes you are, even if what you are writing doesn’t seem like a story — then you must be aware that what is going on in your mind is not necessarily being conveyed to your reader. If you start out in one location in the first paragraph and wind up in another location in the second paragraph, the reader will want to know how you got there. That’s called “tracking” — and it’s a writing issue that many writers tend to ignore. Color. You, the writer, must do your best to create a piece of writing that feels vivid and fully drawn. Bland, colorless writing goes down like cold porridge, while overcooked writing, screaming with verbal sound effects, is as hard to swallow as Sriracha on four-alarm chili. Finding a palette that works for you (and this needn’t be and probably shouldn’t be the same palette for everything you write) will play an important role in determining if your writing is successful. You have many colored pencils in your box. The key is to find which ones work for you — an issue we will be taking up in detail as we go forward. Courtesy. DO YOU KNOW WHAT I MEAN BY COURTESY? If you’re familiar with email courtesy, then you know that the sentence I just wrote, entirely in capital letters, is called “shouting.” People don’t like to be shouted at — it feels discourteous — and so an email in all caps is a no-no. Think about ways that you, the writer, might be discourteous to your reader. Persuasive writing, for example, should not be peppered with exclamation points as you try to make your points. (E.g., “Dear Sir or Madam, I was infuriated to discover that the squeegee I ordered from you did not work! I would have expected more, given your Amazon reviews!”) Sarcasm, snarky comments, arch expressions, especially those in a foreign language (Comme ça! ), are all ways to alienate the reader — and an alienated reader is tremendously difficult to reel back in. Remember, readers can find many other things to do with their time instead of reading what you have written. Commitment. Of our six Cs, commitment is probably the most difficult one to get a bead on. We understand readily what it means to be courteous, concise, and clear, but when we say that a writer needs to be “committed,” what are we suggesting? By commitment, we mean that you will try to make your piece the very best it can be. If it takes eight drafts to get a piece right, even a short one, so be it. It’s not done until it’s done. And the issue of commitment brings us to the contract that writers have with themselves. As we’ve said, when you set out to write, you enter into an implicit contract with your reader. Let’s further examine your end of the deal and consider the issue of discipline. If you bring certain habits to your writing, your chances of staying with the work and improving at it increase exponentially. Orwell’s remarks strike me as quite wonderful, and they align with what I have written about your contract with the reader. That is to say, Orwell is talking about the issues of clarity, conciseness, and color that we have identified. “But I’m not looking to be a scrupulous writer,” I hear you protesting. Okay. I understand that not everyone is cut out to be as scrupulous a writer as Orwell, but even so, all writers should aspire to the standards they set for themselves. Let’s use the word rigor, shall we? It’s a buzzword in educational circles these days, but it is often misused and misunderstood. Rigor is about learning at a high level and becoming truly engaged in your learning. In that sense, I like the application of the word rigor to the writing process as we have been describing it. It is important to understand, right from day one, that writing requires rigorous work. Writing doesn’t come easily to professional writers, and it won’t come easily to you. That needn’t be a problem, however. A lot of things in life don’t come easily, like a good golf game or graceful ballroom dancing, but we’re willing to work at those things. Similarly, we need to be willing to work at our writing to bring it along to higher levels — and the results, when we do that work, are soon apparent. Many writing problems are rather simple and technical in nature, and those can be ironed out easily enough. When some of those problems start to fall away, your confidence will increase, and greater confidence will lead to greater overall fluidity and control in your writing. Rigor starts to kick in as well when you begin to recognize that writing is a knowable process and that your drafts are a critical component of that process. We will discuss the drafting process in detail when we come to Step Five, but for now it is important to remind ourselves that every piece of writing should go through as many drafts as necessary to get it right. An email may take only one draft — but if you don’t like spelling mistakes in your emails (as I don’t), then it will likely take more than one draft. More demanding writing projects will inevitably require more drafts. It is important to understand that the drafting process is not simply a matter of heaping draft upon draft, with no particular logic or design. Each draft has a focus and a purpose, and when you understand that, as you will by the end of this book, you can then work more effectively and with a better chance of fulfilling that contract with yourself. 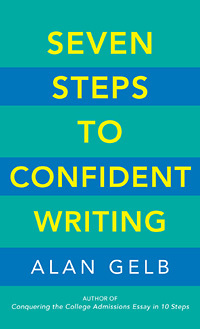 Alan Gelb is the author of Seven Steps to Confident Writing as well as the bestselling book Conquering the College Admissions Essay in 10 Steps. He is a writing coach and communications consultant for higher education, and his writing has appeared in the New York Times, the Daily Beast, Next Avenue, and many other publications. He lives in upstate New York. Find out more about his work online at www.AlanGelb.com. Excerpted from the book Seven Steps to Confident Writing. Copyright © 2019 by Alan Gelb.